Martin & Yager | Giving Back ";s:21:"divi_integration_body";s:415:"
Pet Valu has partnered with Lion’s Foundation of Canada Dog Guides nationally to help raise funds and awareness for the valuable services they provide. This wonderful organization makes a huge impact in the lives of Canadians with a medical or physical disability, by providing specialized Dog Guides at no cost to those who need them. Every donation – big or small – helps make a huge difference in the life of a fellow Canadian, like Martin. Meet Martin & Yager, the first team you’ve helped sponsor through donations for our 2015 Calendar. A Toronto resident and retired surgeon whose eyesight has gradually deteriorated over the years, Martin ultimately found himself dependent on his family to safely make simple trips outside of his home, limiting his otherwise independent lifestyle. 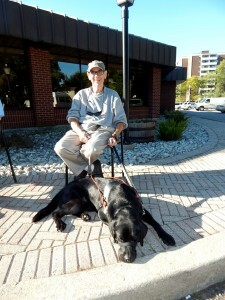 Martin reached out to Dog Guides regarding their Canine Vision program. After completing the application and interview process, the trainers and staff at Dog Guides paired Martin with Yager, who’s personality and disposition suited Martin’s needs and lifestyle. The pair is made for each other! Martin and Yager were introduced at the Dog Guides facility in Oakville, ON and completed an extensive 25 day live-in training program to learn how to work together and navigate obstacles they would meet in every day life. Yager is a mild-mannered and laid back black Lab who Martin describes as a “cool guy” and who instantly became a beloved family member and the boss of the house. Martin reports that his wife and grandchildren are crazy about Yager. Most importantly, Yager has given Martin back his freedom and independence. Since teaming up with Yager, Martin can now navigate city streets and public transit without having to rely on another person with a considerable degree of independence and safety. “It’s just terrific. I can’t tell you how wonderful it’s been so far,” adds Martin. Martin is so impressed by the program and grateful for your support, that after his graduation he and his wife sponsored another Dog Guide team. He praises Lions Foundation of Canada Guide Dogs staff and volunteers for their commitment and the outstanding personal relationship they form with everyone who receives one of their Dog Guides. Why donate? In Martin’s words, supporting a Dog Guide team is a sure way to make an immediate and substantial improvement in someone’s life. Every Guide Dog is trained in one of six specialized programs: Canine Vision, Hearing Ear, Service, Seizure Response, Autism Assistance and Diabetic Alert. They improve lives in immeasurable ways: From giving a visually or hearing impaired person back their independence, to helping an autistic child navigate life’s challenges, and so many more. Dog Guides change lives. Let’s help change as many as possible. To raise, train and place each Dog Guide costs approximately $25,000, but none of that cost is passed on to the qualified applicants who are teamed up with a Dog Guide. Lions Foundation of Canada does not receive any government funding, but relies on support from generous people like you. Please give generously and help place a life-changing Dog Guide with a Canadian with a disability.